Foreground Colour – The foreground or text colour of an item. The colors are user configured for any purpose the company requires. For instance items that are discontinued can be green. Background Colour – The background colour of an item. *The colors of items appear in inventory, on inventory lists, in sales orders, on purchase orders and on inventory adjustments. Save/Close – Saves and closes the window back to the main inventory list. Copy – Copies the item allowing user to edit the warehouse and part number before saving. Navigation Arrows – Navigates between inventory records keeping the list filtered and sorted as it was when the item was edited. Non-Physical – For items that are not physically in inventory. Use this for things like labor or miscellaneous items that belong in a particular sales department. Use caution with cost on non physical items. Be sure that the sales department used does not credit the inventory GL account, unless the user makes sure that an corresponding AP entry gets debited to the inventory asset account. Manufactured – For items where a template is created to deplete raw material items from stock when building and receiving the finished product into stock. The build process will credit inventory raw material and debit inventory finished goods, if their sales departments are different. Raw Material – Treated the same as normal items. The only reason for a different type is that some companies want to see raw material separately in stock from normal items. 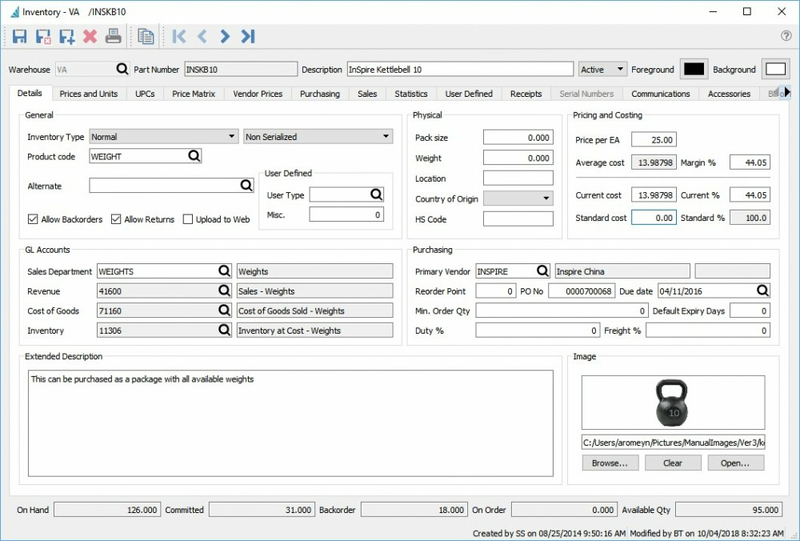 Serial/Lot – Inventory items can be set as serialized or lot controlled. When serial numbers are received into stock each serial number has a quantity of 1. Lot numbers can be received with many to the same lot number. When the item is added to a sales order the user is presented with the serial/lot number(s) to select. For more details on Inventory Lot Control See this link. Product Code – This is used to group common inventory items together. The product code can be related to ‘Sales Dept’ so that when an items product code is edited the related sales department is also changed. Alternate – Sets an alternate inventory item so that if an item is out of stock and it is added to a sales order the user is prompted if they would like to replace it with the alternate, or to back order the item that is short. This is also useful if the item has been replaced and the user accidentally uses the old part number. Allow Backorders – If unchecked this item cannot be back ordered. Allow Returns – If unchecked this item cannot have a negative quantity shipped. User Type – This alphanumeric field can have its label defined in Company Settings/Variables and has a lookup tables associated with it. Sales Department – The name describing the type of item being sold.See ‘Sales Dept’ in company settings. Pack Size – The standard pack size that an item is bought and or sold in. This field appears on the sales order line to encourage the salesperson to sell full packs, but does not warn or use full packs automatically. Location – The location of this item in inventory. Country of Origin – The country where an item came from that needs to go onto an international bill of lading. HS Code – The harmonized system customs code that may need to go onto an international bill of lading. Current Cost – What was last paid for an item or what the user edited the cost to. If the on-hand quantity is zero and the user edits the current cost the average cost will get the same value. Standard Cost – A cost that only changes if the user sets it. This is commonly used to inflate the cost by adding overhead to it. This cost can be used to post to sales history instead of current cost in company settings/Sales Orders/Process/Post Standard Cost to Sales History Current Cost. Primary Vendor – The vendor that the item is usually purchased from. Duty % – The usual duty charged on this item. This field is editable, and if the ‘Save Landed Cost’ is turned on in Company Settings/Inventory this will be updated when receiving a purchase order and the user has edited it on the PO line. PO Number The last purchase order number issued for this item. This field is editable. Due Date The due date of the last purchase order issued for this item. This field is editable. Default Expiry Days – When an item that is lot controlled is received this number is added to the receive date to calculate the expiration or best before date. Freight – The usual freight charged on this item. This field is editable, and if the ‘Save Landed Cost’ is turned on in Company Settings/Inventory this will be updated when receiving a purchase order and the user has edited it on the PO line. Extended Description – A long description an be added here for this item. It can be printed on sales reports and invoices. There is a sub report for this purpose on the Spire stock reports but is hidden by default. Contact your Spire partner if you do not have the knowledge to edit this. On-hand – Quantity on-hand of this item. It includes all committed items. Committed – Quantity that are committed on sales orders, production orders and inventory adjustments/transfers in transit. Backorder – Quantity on back order on sales orders. On Order – Quantity on issued purchase orders not yet received. Available – On-hand quantity minus committed quantity.